The Town will hold a Public Hearing regarding the Meadow Drive/219/mixed use project on December 21, 2017 6:30pm at Town Hall - come and express your opinion! UNYTS (Organ transplants) Blood Drive - Tuesday, December 19, 2017 3:00pm-7:00pm at Town Hall. Santa visits the Patchin Fire Hall on Sunday, December 17, 2017 starting at 1:00pm - come and see Santa! The weather has cancelled this event: Our Boston Town Band will perform at Boston Valley School on Tuesday, December 12, 2017 at 7:00pm - click or tap here for more information! The Zoning Board of Appeals meeting for Thursday, December 7, 2017 at 7:00pm at Town Hall is cancelled due to weather - click or tap here to read the original schedule announcement. Faith United Church will serve you Breakfast with Santa on Saturday, December 2, 2017 from 9:00am to 11:00am and visit their Craft Sale from 9:00am to 2:00pm - come and share the Christmas Spirit! 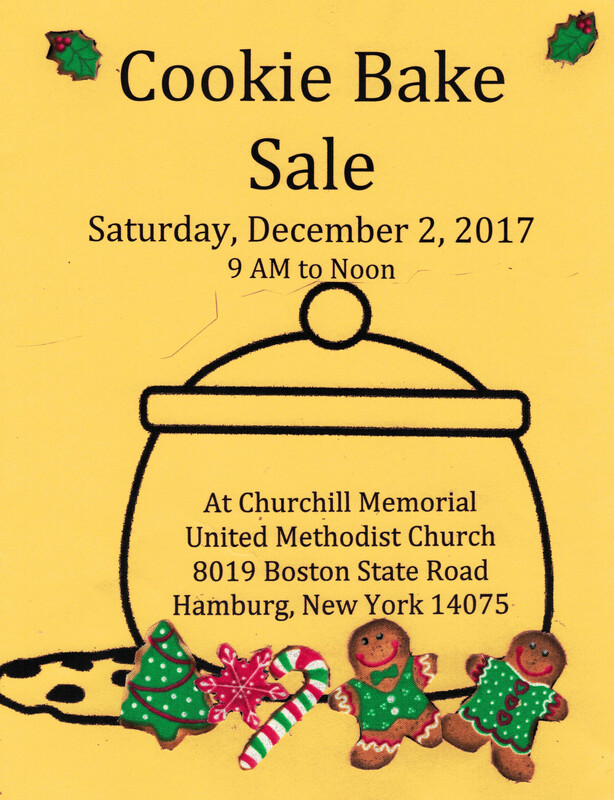 Churchill Memorial United Methodist Church is hosting a Cookie Sale on Saturday, December 2, 2017 from 9:00am til noon - stop in and buy some Christmas cookies! The Western New York Snowmobiling Club of Boston (scroll to the bottom) is providing the 2017 Youth Snowmobile Safety Course on Saturday, December 2, 2017 9:00am-4:00pm at the Boston Amvets Post - contact the Club for a reservation (941-6076)! The Boston Free Library is hosting a number of events in November - click or tap here for details! The Public Hearing for the Meadow Drive project (mixed use/219 project) scheduled for Monday, November 20, 2017 at 6:15pm at the Town Hall is cancelled. A Special Town Board Meeting is scheduled to discuss the Boston Highway Department Storage Building contract on Monday, November 20, 2017 at 8:30am. Primerica and Cam Borowiec are providing a Free Educational Workshop on Money & Business at the North Boston Fire Company Hall on Saturday, November 18, 2017 from 7:00pm to 8:00pm - come down and learn about Financial Freedom! There is a presentation and informational session about the Meadow Drive project (mixed use/219 project) scheduled at Town Hall on Wednesday, November 8, 2017 starting at 6:30pm - come to learn and discuss the plans! Please vote on Tuesday, November 7, 2017 - it's our duty as Americans! The Patchin Fire Company presents a Ham and Turkey Raffle on Saturday, November 4, 2017 at 7:30pm at the Hall - $5 admission gets you into the bidding! The Zoning Board of Appeals is holding a Work Session on Thursday, November 2, 2017 at 7:00m at the Town Hall - come and hear about the requests! 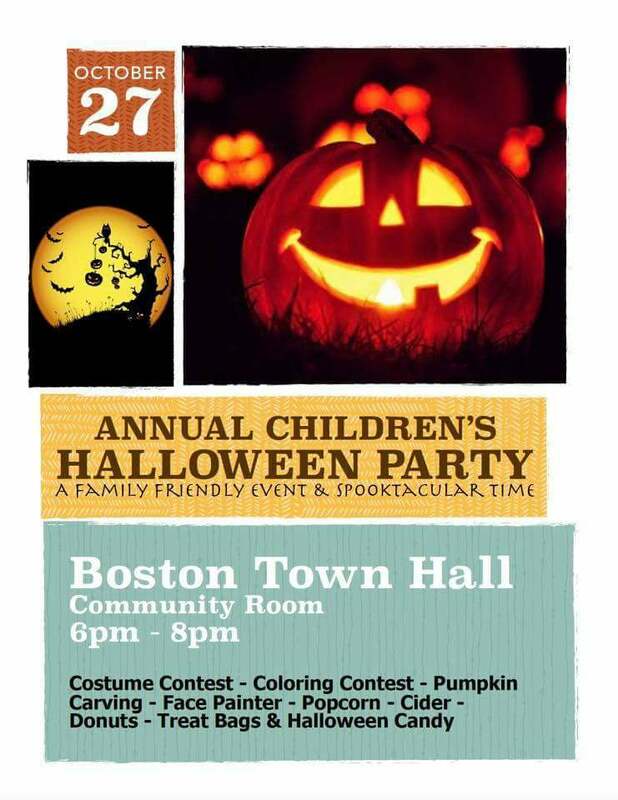 There is a Halloween Party at Town Hall on Friday, October 27, 2017 from 6:00pm-8:00pm and includes a Costume Contest, a Coloring Contest, a Face Painter, Pumpkin Carving (or coloring for little tiny hands - Kids: make sure you bring a parent/guardian), and Apples, cider, donut holes, popcorn and treats galore (allergy free also). Check out the SPOOKTACULAR DECORATIONS! 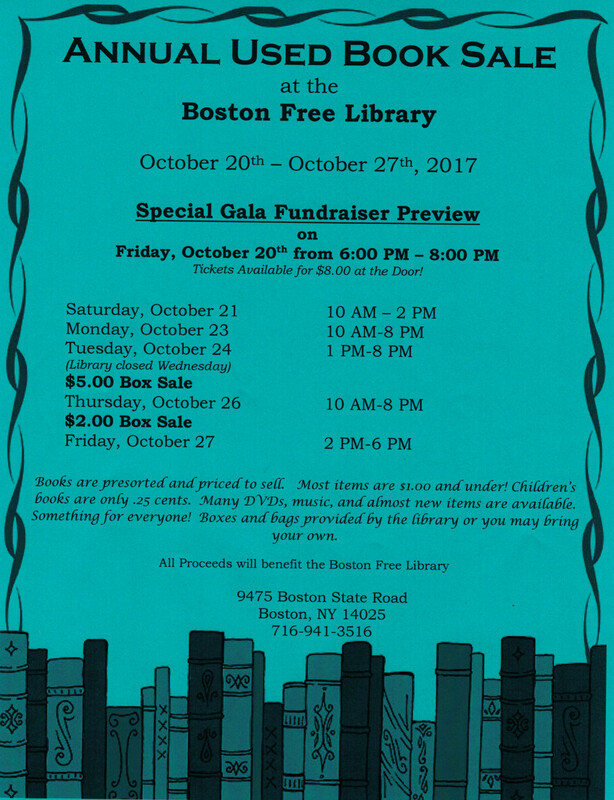 The Boston Free Library is holding a Used Book Sale from Saturday, October 21, 2017 thru Friday, October 27 2017 during regular Library business hours. Stop in and buy a book! Faith United Church of Christ is hosting the Lake Effect Harmony Chorus as they teach a capella singing Tuesdays, October 3 10 17 & 24, 2017 7:15pm-9:15pm Come and visit and sing - contact June at 627-4894 or at jdonavanreg16@roadrunner.com for more information! UNYTS (Organ transplants) Blood Drive - Tuesday, October 24, 2017 2:00pm-7:00pm at Lakeshore High School. This event was originally to take place at Our Town Hall but had to be moved because of a young woman in treatment and in need. Churchill Memorial United Methodist Church is hosting their semiannual fish dinners on Friday, October 6 and 20, 2017 4:30pm-7:00pm at the church. Stop in for dinner or a takeout! 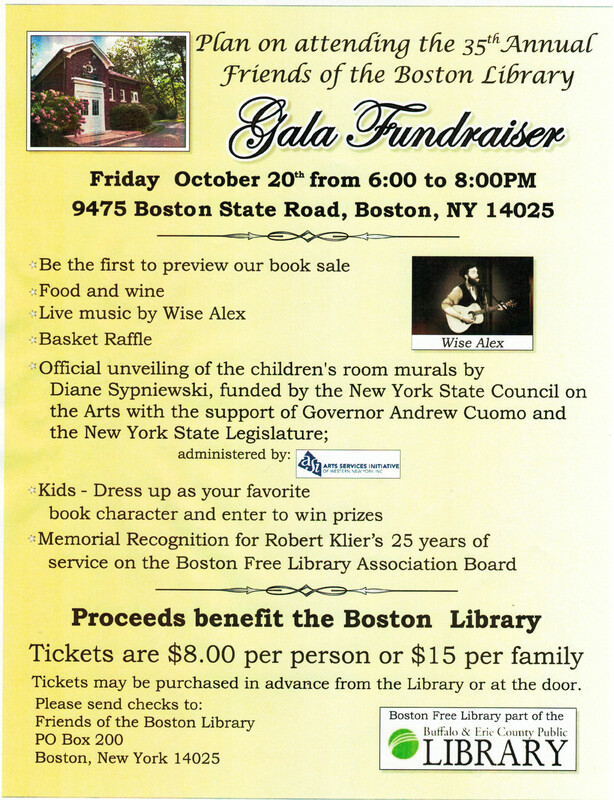 The Boston Free Library is hosting it's annual Gala Fundraiser on Friday, October 20, 2017 from 6:00pm to 8:00pm. Come listen to Wise Alex and more! 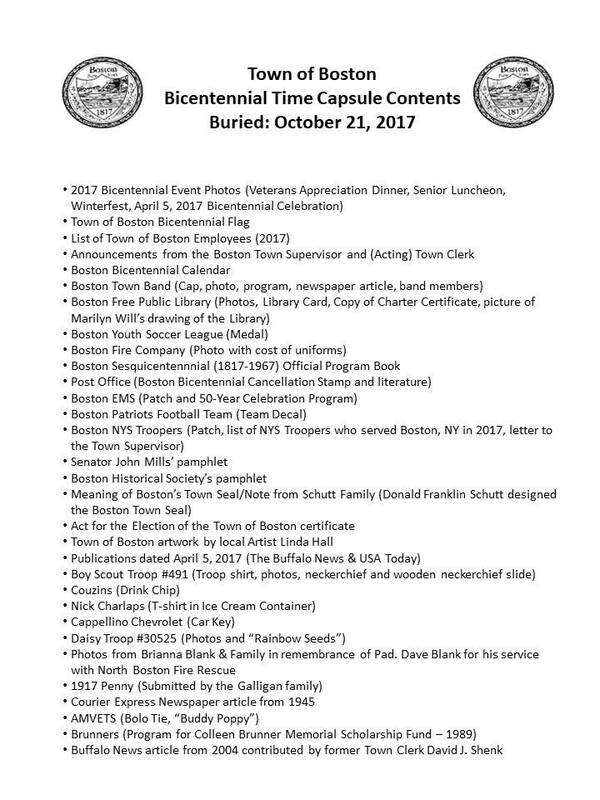 The Town of Boston is burying the time capsule it purchased back in April 2017 on Saturday, October 21, 2017 at noon - click or tap here to see the capsule contents! Flu season is coming (sadly), so stop by the Town Hall for your flu shot - Professionals from the Visiting Nurses Association will be available on Friday, October 13, 2017 10:00am-2:00pm to administer your shot. Stop by the Town Clerk's office now to get and fill out (or drop off) the Demographic form! Saint John's Roman Catholic Church is holding a Turkey Dinner on Sunday, October 8, 2017 starting at 11:30am - stop in for a meal! Councilman Keding has arranged for Emergency Preparedness training for Boston citizens at the North Boston Fire Hall on Tuesdays and Thursdays, September 7 through October 3, 2017 6:00pm-9:30pm - click or tap here for details and the registration link! The Boston Fire Company is hosting it's semi-annual Chicken BBQ - stop in on Sunday, October 1, 2017 starting at 11:00am for lunch or a takeout! The Alfred Dye Insurance Agency is sponsoring a School Supply Drive in support of our Local Schools: Eden, Springville, Hamburg, Orchard Park - please bring school supplies to their office August 21 through September 29! Councilman Keding has worked with Deputy Aaron Naegley of the Erie County Sheriff's Department to hold an Open House under the Lions Shelter behind Town Hall on Saturday, September 16, 2107 from 11:00am until 3:00pm. They will check child safety seats and issue child ID cards, plus the Mounted Unit and SWAT truck and helicopter will pay a visit (weather permitting)! The ﻿Boston Free Library is hosting lots of events this summer thru August this year - click or tap here for details! Wednesdays from June 28 to August 30 10:00am-12:00noon is Open Play at The ﻿Boston Free Library! Toys are provided so bring a snack and meet up with friends! The Hamburg Parent/Teacher/Student Association will benefit from a Electronics Recycling Event open to Boston Residents (no A/C units, busted tube TVs, or alkaline batteries) - bring your old electronics to Erie Community College South Campus on Saturday, August 26, 2017 9:30am-1:30pm! The Patchin Fire Company is hosting it's Annual Meat Raffle on Saturday, August 26, 2017 at 7:30pm at the Hall! Come watch Beauty and The Beast behind Town Hall on Friday, August 25, 2017 at sundown - more entertainment starts at 7:30pm! Save a Cat - Eat a Dog! George's Hotdogs is hosting a Ten Lives Club benefit event on Tuesday, August 22, 2017 4:30pm-7:30pm - come and eat a hotdog! The Boston Arts Council 25th Annual Concert Series has begun behind Town Hall - Tuesday, August 22, 2017 at 6:00pm come hear Black Widow and have a snack from the Food Trucks! The Town Planning Board meeting for August 8, 2017 is cancelled. The Boston Zoning Board of Appeals will hold a Public Hearing on Thursday, August 3, 2017 at 7:00pm at the Town Hall - come and express your opinion! Come hear the Boston Town Band Wednesday, August 2, 2017 at Hamburg Village Park (corner of Lake & Union Streets) at 7:00pm - Come Support Our Band! Faith United Church of Christ is hosting it's 3rd Annual Summer Christian Music Festival at the church on Saturday, July 22,12017 5:30pm-8:00pm - free admission! Food and refreshments to benefit Boston Meals on Wheels! The ﻿Boston Free Library is hosting a Windows 10 training class on Wednesday, July 19, 2017 10:00am-12:00noon. Students will become familiar with the desktop, the Start button, Microsoft Edge, and the Windows store. Call 941-3516 to reserve your spot! Churchill Memorial United Methodist Church is hosting Vacation Bible School on Monday thru Wednesday July 17 thru 19 9:00am-11:00am at the church! The ﻿Boston Free Library is hosting lots of events this summer thru August this year - click or tap here for details! Plus a Craft Fair and Music event on Thursday, July 13, 2017 5:00pm-8:00pm! The Annual Bob McDonnell Car Cruise will happen on Tuesday, July 11, 2017 at 5:30pm-9:00pm at the Boston Town Park Lions Shelter behind Town Hall. Proceeds benefit Hospice of Buffalo - click or tap here to visit the Facebook page! The Boston Lions Club is sponsoring the 3rd Annual Golf Outing Saturday, July 8, 2017 - click or tap here for more details! The Boston Zoning Board of Appeals will hold a Meeting and Public Hearing on Thursday, July 6, 2017 7:00pm - come and express your opinion! Car Cruise To Benefit Scouting will be held Wednesday, July 5, 2017 at Cappellino Chevrolet from 4:00pm to 9:00pm! A Boston NY Public Hearing about the 219 project is scheduled at Town Hall for Wednesday, July 5, 2017 7:40pm - come and express your opinion! Come see the Boston Town Band and Independence Day fireworks Tuesday, July 4, 2017 behind Town Hall at 8:00pm for the Town Band and 10:00pm for the fireworks! The Boston Town Band will perform next at Angola's Centennial Park, Main Street in Angola on Wednesday, June 28, 2017 at 7:00pm. ﻿Click or tap here for more info! The Informational Meeting for the Quaker Estates (219) project scheduled for Wednesday, June 28, 2017 7:00pm is cancelled. There was simply not enough time to prepare all the information for presentation. 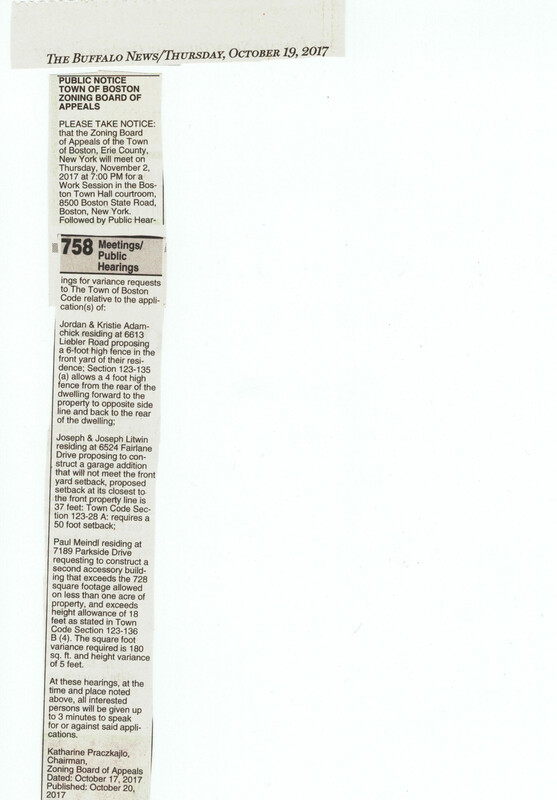 Please attend the July 5 Town Board meeting for the Public Hearing! UNYTS (Organ transplants) Blood Drive - Tuesday, June 20, 2017 3:00pm-7:00pm at Town Hall! 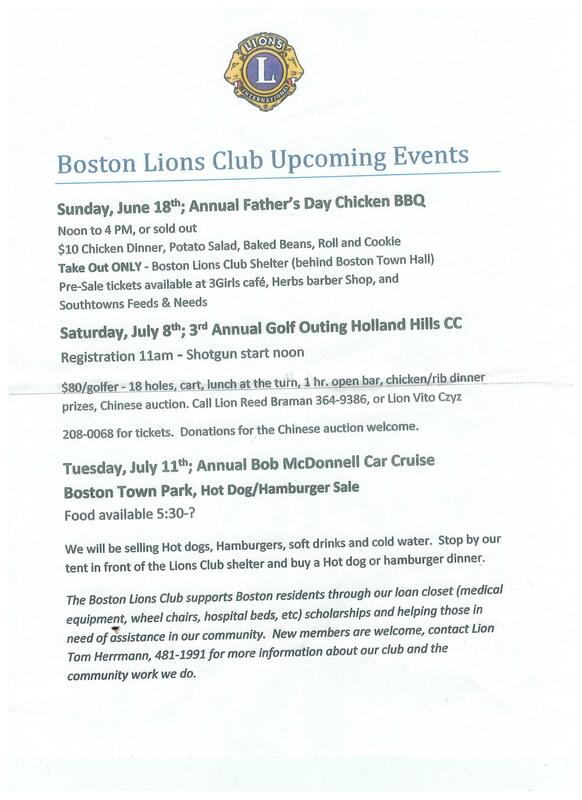 The Boston Lions Club is sponsoring it's Annual Father's Day Chicken BBQ behind Town Hall on Sunday,June 18, 2017 noon-4:00pm (or sellout). Take out only! Tickets at 3Girls Cafe or Herb's Barber Shop or Southtowns Feeds & Needs. The Annual Trooper Brinkerhoff﻿ Memorial Race starts behind Town Hall - June 17, 2017 - Click or tap for details! The Boston Free Library is hosting "Gravitational Bull!" on Thursday, June 15, 2017 at the Library. Come and see juggling, comedy, magic and have tons of fun - call 941-3516 to register! Boy Scout Troop 491 will host their Annual Flag Day Ceremonies on June 14, 2017 at 7:00pm - bring your American flags to retire! St. John the Baptist Roman Catholic Church is hosting the 20 Week Club drawing and dinner Saturday, June 10, 2017 5:00pm-9:00pm with The Auslanders. Donation is $40 and weekly drawings are happening now - contact the office for information! Boston's Conservation Advisory Council is looking for a few good people to help pick up trash on 219 on Saturday, June 10, 2107 - the Adopt-A-Highway program! If you're interested, please call Scott Johnson at 307-0927 ! Good Shepherd Lutheran Church is sponsoring a Rummage Sale on Friday and Saturday, June 9 and 10, 2017 9:00am-3:00pm both days. Come and discover an array of hidden treasures for sale! The ﻿Boston Free Library﻿ would like your thoughts on Storybook Murals for the Library on Thursday, June 8, 2017 6:30pm-7:30pm. The Storybook Murals are funded by a Community Arts Grant from the Arts Services Initiative of Western New York and the New York State Council on the Arts - come and help our Library! The Town Board will hold a Public Hearing regarding property use via franchise on Wednesday, June 7, 2017. The Boston Fire Company will hold a Benefit Auction on Sunday, June 4, 2017 - they are seeking resalable items. 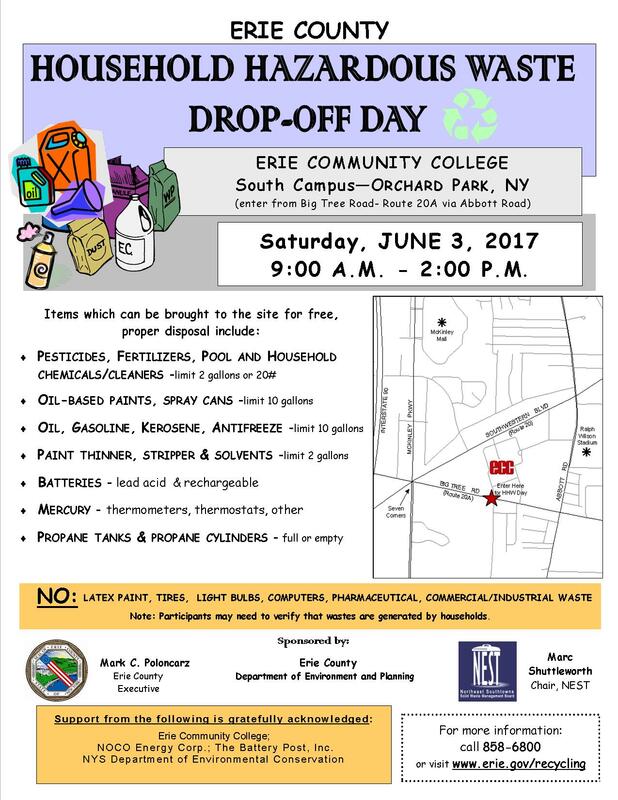 ﻿﻿Erie County will sponsor a Hazardous Waste Drop-Off open to Boston residents at Erie Community College ECC South on Saturday, June 3, 2017 9:00am-2:00pm. Click or tap here for the details! The Town of Boston will host the 2017 Memorial Day Parade on Monday, May 29, 2017 at 1:00pm﻿﻿. The parade will start at Churchill Methodist parking lot and proceed to Town Hall and the Boston Town Band will play! The Boston Historical Society is hosting a Civil War Living History at the Erie County Fairgrounds on Friday, May 19, 2017. From 9:00am-2:00pm, five local schools (Hamburg, St. Mary's, St. Andrews, St. John Vianney, Southtowns Catholic) will be immersed in our US Civil War. From 4:30pm-7:30pm the facility is open to the public - Come and learn about our American Civil War! The Erie County Highway Department will close the Mill Street bridge (near Boston Fire Hall) for repairs for 2-8 weeks starting Tuesday, May 16, 2017. The Boston Historical Society is hosting a Mother's Day Opening at the Boston Historical Museum on Sunday, May 14, 2017 2:00pm-4:00pm! The Annual Boston Conservation Advisory Council Fishing Derby will take place on Saturday, May 13, 2017 10:00am-3:00pm behind Town Hall! Registration is at 9:30am! The Boston Valley Elementary School PTSA is hosting it's First Meat Raffle on Friday, May 12, 2017 6:00pm-10:00pm at the Knights of Columbus Hall #2220, 53 Pierce Ave, Hamburg, plus there are several other raffles. Contact Nancy Krencik at BVSMEATRAFFLE@GMAIL.COM or by mail at 42 Martha Place, Hamburg for tickets at $5. Help support our Elementary School! Churchill Memorial United Methodist Church is hosting their semiannual Fish Dinners on Friday, April 28 and May 12, 2017 at 4:30pm-7:00pm. Come and enjoy fish, salads, dessert, and beverage for $11.00! The Town Planning Board will meet on Tuesday, May 9, 2017 at 7:30pm. Discussion of the 219 project is scheduled - come and express your opinion! The Boston Historical Society is hosting a Child Safety Day at Town Hall on Saturday, May 6, 2017 from 10:00am-2:00pm. 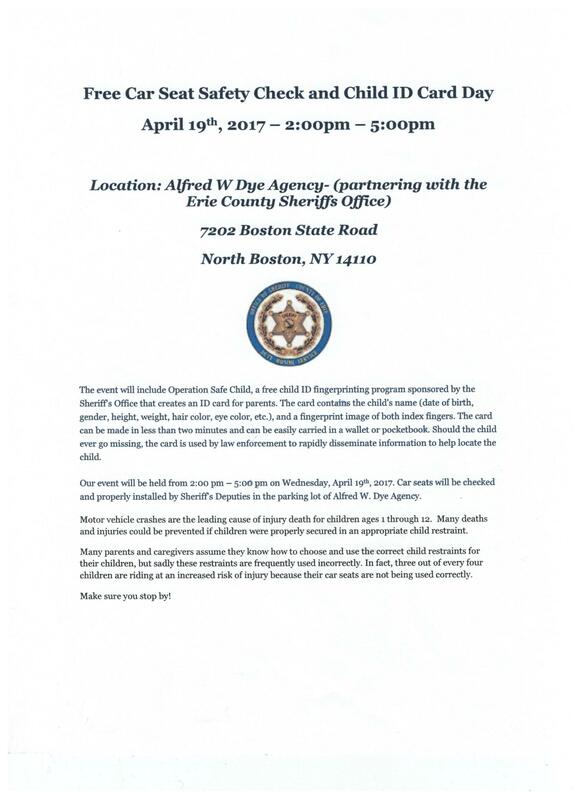 The New York State Police and Erie County Sheriffs will be there to show their K-9 troops, providing Kids-ID, checking car seats, and more. Come have fun and learn how to help your child stay safe! The Patchin Fire Company is hosting it's Annual Meat Raffle on Saturday, May 6, 2107 at 7:30pm, free admission and free refreshments! Churchill Memorial United Methodist Church UMW is hosting a Woman's Retreat on Saturday, May 6, 2017 9:00am-1:00pm at the church. The theme is "Women of the Bible -- What Can We Learn from Them? Through Scripture, Song, and Humor" by Carol Mullins (Quiet Whispers Ministry). Door prize is a Women of the Bible quilt, and a continental breakfast and lunch is provided. Contact Diane Helmbrecht at 941-3412 to arrange the $15 registration fee! The Boston Fire Company is hosting an Open House at their new Fire Hall on Saturday, April 29, 2017 11:00am-3:00pm! The Town Board will hold a Public Hearing on Tuesday, April 25, 2107 9:00am regarding property at 7305 Omphalius Rd (Town Clerk's residence) and how it relates to Town Code 47 for Unsafe Buildings. Click or tap here to see the Town Board's Feb 2017 inspection report and how it relates to Town Code 57 for Fire Prevention and Building Code Administration. Click or tap here to see the November 2016 Public Hearing announcement (and more listed with ﻿News﻿). Come and express your opinion! The Curbell Company is hosting a recycling event open to Boston residents on Saturday, April 22, 2017 from 9:00am-1:00pm. Click or tap here for details! Alfred W Dye Insurance is hosting a free Car Seat Safety Check and Child ID Card Day in their parking lot on Wednesday, April 19, 2017 2:00pm-5:00pm - stop by with the kids! The Annual Easter Egg Hunt is happening Saturday, April 15, 2017 from 1:00pm until 4:00pm behind Town Hall - and it's happening rain or shine! The Boston Historical Society is hosting a potluck dinner on Tuesday, April 11, 2107 at 6:00pm at Town Hall - bring a dish to pass. 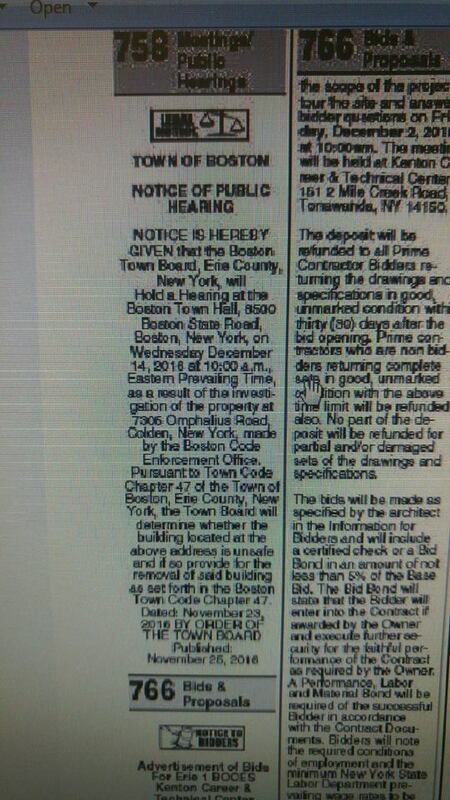 There will be a "Town of Boston - Fact or Fiction?" game following dinner! How well do YOU know our town?!? Raphael's Restaurant is hosting Paint Night on Monday, April 10, 2017 7:00pm-9:00pm - Paint a pair of Sunflower or Daisy Wine glasses and create your own Wine Charm! Call 941-3119 for reservations! The ﻿Boston Free Library is offering an introduction to Windows 10 on Thursday, April 6, 2017 5:30-7:30pm. Students will become familiar with the desktop, the start button, Microsoft Edge, and the Windows Store. Call 941-3516 to register - space is limited! Trout fishing season opens on April 1, 2017 - stop in at Town Hall to pick up your license! The New York State Department of Environmental Conservation will stock 18 Mile Creek on Tuesday, March 28, 2017 at 12:30pm - click or tap here for details! 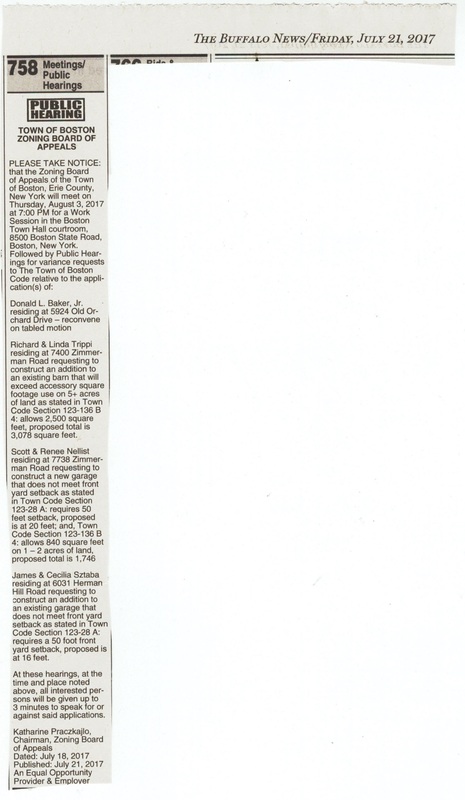 The Boston Planning Board is holding a Public Hearing on Tuesday, March 28, 2017 at 8:00pm to review plans for the Deanna Drive development. Come and be heard! Good Shepherd Lutheran Church is hosting a Spring Open House & Brunch on Sunday, March 26, 2017 at 9:30am. All are invited! Churchill Memorial United Methodist Church presents the Buffalo Silver Band on Sunday, March 26, 2017 at 3:00pm. All are welcome! Faith United Church of Christ is hosting a Drive-thru Chicken BBQ on Saturday, March 25, 2017 from noon until 2:00pm. Pre-sale only, please call 941-3529 to order! The Boston Fire Company is requesting sponsors as they participate in the American Lung Association's Fight for Air Stair Climb on March 11, 2017. The Company will be climbing 24 stories in full firefighting gear to help fund research and education on different lung diseases from asthma to lung cancer! Faith United Church of Christ is hosting this year's World Day of Prayer on Friday, March 3, 2017 at 10:00am. All are welcome! Boston Zoning Board of Appeals is meeting Thursday, March 2, 2017 at 7:00pm at Town Hall for public comment on two petitions. The Boston Amvets Post 219 is hosting their Annual Chicken Bar-B-Que on Sunday, February 26, 2017 11:00am until sold out - $10 per dinner and take-outs are available! The Public Hearing for Emergency Services contracts is rescheduled for Wednesday, March 1, 2017 at 7:40pm at the Boston Town Hall. Kissing Bridge Boston Sunday Ski Club starts Sunday, January 9, 2017. Click or tap here to see the registration form (you'll have to print it). Boy Scout Troop 491 is holding their Annual Pancake Breakfast on Sunday, February 4, 2017 from 8:00am to 2:00pm at the Boston Town Hall. All you can eat for $6.50 per person! The Zoning Board of Appeals meeting scheduled for Thursday, January 5, 2017 is rescheduled for Thursday, February 2, 2017 at 7:00pm. Our New York State Senator Patrick Gallivan is sponsoring an electronics recycling event on Saturday, January 28 9:30am-1:30pm - bring your old computers, TVs, electronics to Parkdale Elementary at 141 Girard Avenue in East Aurora.